A crude allegorical woodcut, bold in design and probably produced for a banner or similar type of display. In the center is a peristyle Temple with an altar on which the figure of Liberty rises from a flame. 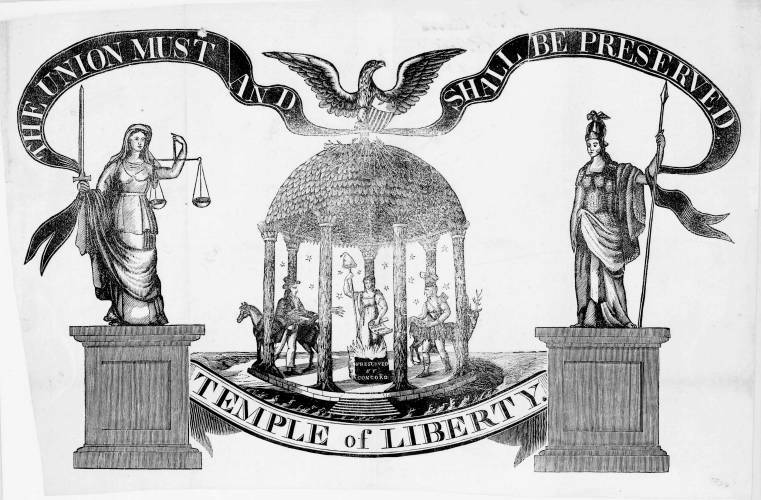 The figure holds the "Bill of Rights," a staff and a liberty cap. The altar is inscribed "Preserved by Concord." To the left is a man with a horse, offering wheat; on the right an Indian with a buck deer offers an animal pelt. Behind the temple are thirteen stars. Above is an eagle with shield, olive branch and lightning bolts, and a streamer with the slogan "The Union Must and Shall Be Preserved." Two pedestals with figures flank the image. On the far left is Justice, on the right Minerva.